Our Light Tree Tempo is accurately depicted at the left. 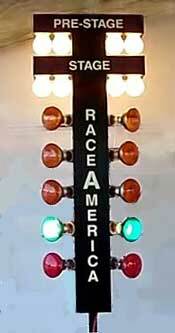 It is not the tempo of a real light tree (often called a "Christmas Tree") at a real drag strip. But the Pinewood Derby is not a real drag strip either. For one, a real drag strip is strictly a 2 Lane format. For another, the Pinewood format ensures that all cars start at the same instant, so the pre-stage and staging lights have no meaning. The purpose of a real tree is lost in a Pinewood Derby. The purpose of our light tree is to dress up and put a little more pizzaz into the event, much like hanging strings of checkered flags. We also wanted to call attention to the start of each race so that the audience was aware of when the race was about to begin. We determined the tempo of the real countdown is too fast. It's no problem for the race car drivers, because they know exactly what to expect. But if we made it that fast, most of the Pinewood audience would miss the start. "5, 4, 3, 2, 1, Go!" Another factor that shaped our choice of tempo was split gate racing. Young children, particularly if they have not had much practice, do better with our slowed down version of the drag strip lights. Click to see a real tree in action. Also read this article written by a professional drag racer.